Worried that your chicken breasts are always dry and boring? No longer. 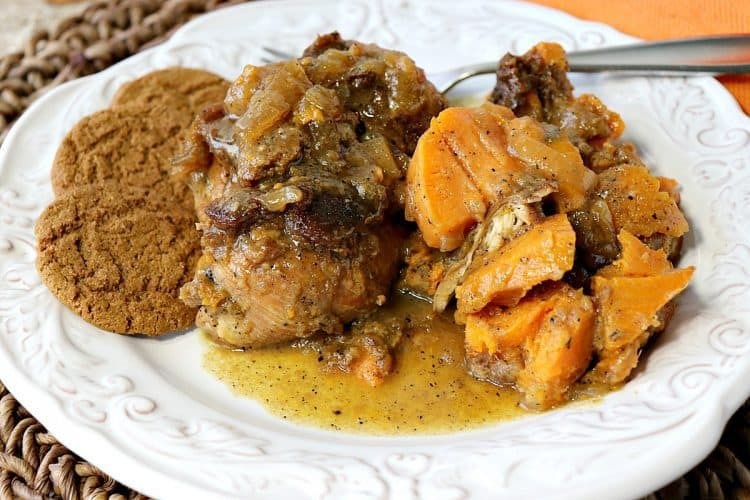 These fork-tender Apple Cider Braised Chicken Breasts with Sweet Potatoes and Gingersnaps are anything but dry and boring! 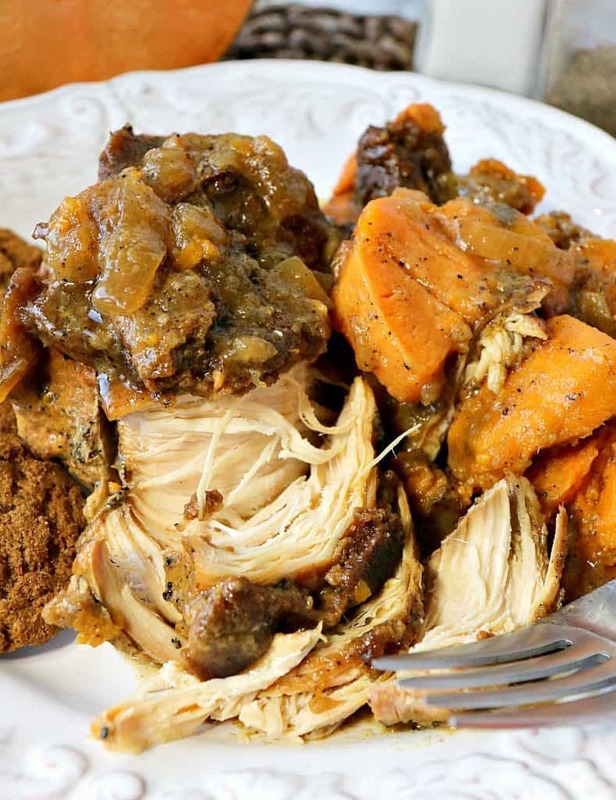 **Please Note – The printable recipe card with detailed instructions, complete ingredient measurements, and nutritional information for making Braised Apple Cider Chicken Breasts with Sweet Potatoes & Gingersnaps is available near the end of this post. Braising is a cooking method in a closed vessel with some sort of cooking liquid. In this case, I used a Dutch oven as my closed cooking vessel and apple cider as the cooking liquid. 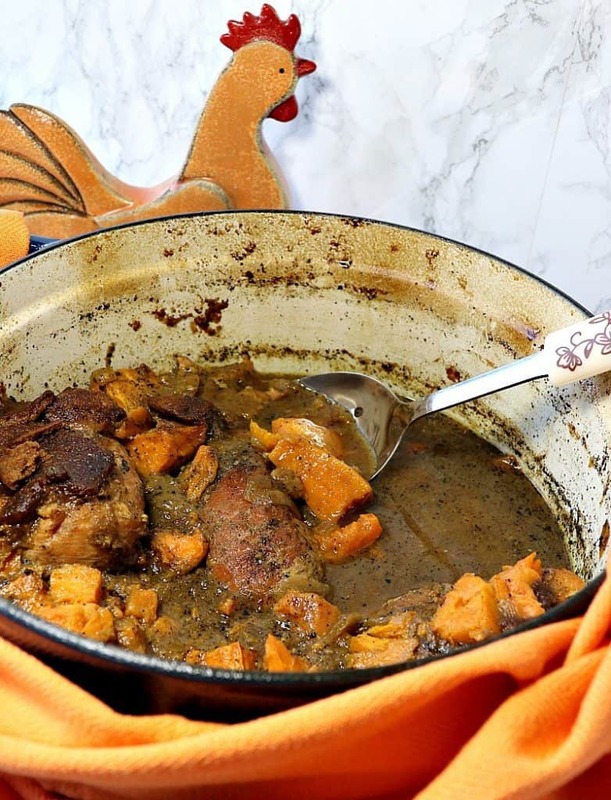 Braising is a super easy method of cooking which makes tough, dry, and cheaper cuts of meat moist and tender due to cooking them low and slow in the oven, or even on the stovetop. 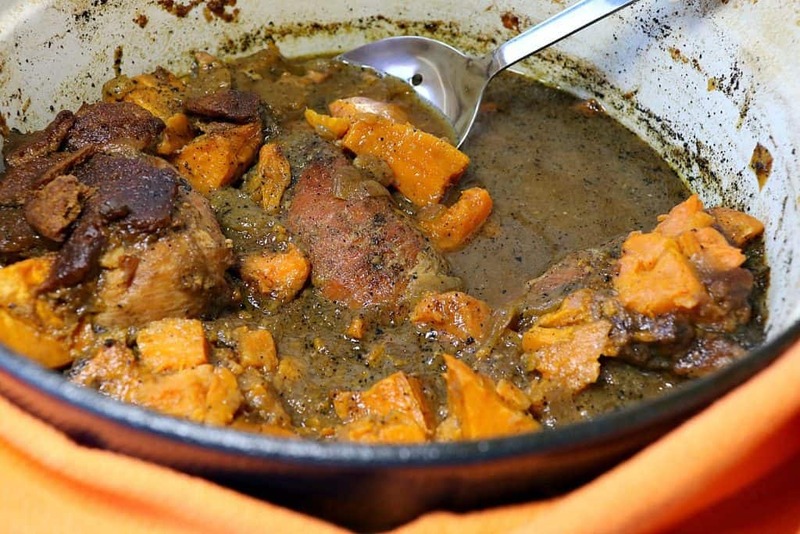 Are there tips to getting the most flavor out of a braise? Yes! Season and brown the meat you plan to braise very well on all sides, before adding the braising liquid. This will add additional flavor to the meat. Once the proteins have been properly browned, add a small amount of the cooking liquid and scrape up all the browned bits of flavor (the fond) from the bottom of the pan. Again, this will add the most flavor possible to the pot and the completed dish. If you’re a regular reader of my blog, then you know that here’s where I like to add all my step-by-step photos. Believe me, I wanted to add them, and I did take the photos, but for the life of me, I can not find them anywhere (on either or my cameras, or on my computer files). I think that I must have accidentally deleted them. Sad. I know. However, as I stated earlier, braising is easy as long as you follow a few basic steps. So here they are, without the photos. 😉 The exact measurements can be found in the recipe card below. *Special Note – Braising takes several hours, however, most of it is hands-off time, so please plan accordingly. Braising is best saved for a weekend when more time is easier to come by. Season and deeply brown the chicken breasts in the oil on both sides, working in two batches if needed. Remove the browned chicken from the Dutch oven and set aside. Add a sliced onion to the pot and cook for 2-3 minutes, stirring occasionally. Add about 1 cup of the apple cider to the pot, making sure to scrape up all the browned bits from the bottom of the pan. Return the browned chicken to the pot and add the remaining apple cider. Cover and place the pot in a 300-degree oven for 2 hours. After two hours, remove the pot from the oven and add the peeled and sliced sweet potatoes to the chicken. Return the pot to the oven for an additional 70-90 minutes, or until the potatoes are tender. Remove the pot from the oven and add in some gingersnap cookies. Cover and return the pot to the oven for an additional 20 minutes. Serve, spooning the cooking liquid and the sweet potatoes over the chicken. 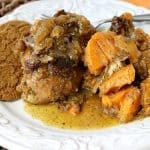 Below is the printable recipe card for today’s Apple Cider Braised Chicken Breasts with Sweet Potatoes and Gingersnaps. If you’ve enjoyed this recipe and look forward to making it (or have already made it), I’d appreciate if you’d take a moment to give it some feedback by way of stars near the comment section at the end of this post. Thank you so much! Season the chicken breasts on both sides with the salt, pepper, and garlic powder. Add the oil to a large Dutch oven and brown the chicken very well on both sides on medium/high heat, working in batches, if needed. Add the sliced onion to the pan and cook, stirring occasionally for 3-4 minutes. Reduce the heat to medium and add 1 cup of the apple cider to the pan with the onion, making sure to scrape up all the browned bits from the bottom of the pan (deglazing). Add the browned chicken back to the pan. Cover and place in a preheated 300-degree oven for 2 hours. 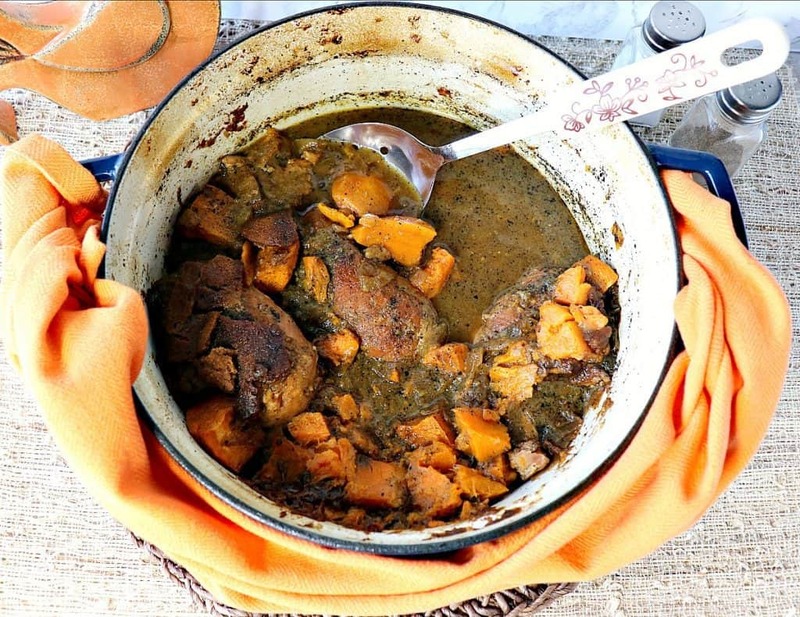 After 2 hours, remove the pan from the oven and add in the prepared sweet potatoes. Return the pan to the oven for an additional 70-90 minutes, or until the potatoes are fork tender. Remove the pan from the oven and add in the gingersnaps. Return the pan to the oven for an additional 20 minutes. To serve, spoon the sauce, potatoes and softened gingersnaps over the chicken breasts. Dutch oven, tongs, potato peeler, chef's knife, cutting board, measuring cups and measuring spoons, wooden spoon. 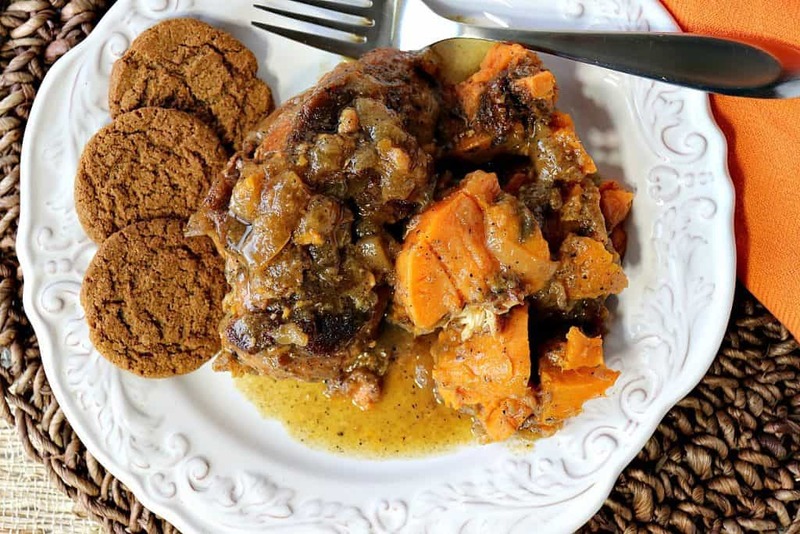 I sincerely hope you’ve enjoyed today’s recipe for Apple Cider Braised Chicken Breasts with Sweet Potatoes and Gingersnaps as much as I’ve enjoyed bringing it to you! I can see why these are your most popular! I can’t wait to try them! These recipes are awesome and I highly recommend them! Thank you for the tips to braise chicken. No more dry chicken breast for me. Thank you!